Be the first to share your favorite memory, photo or story of Angela . This memorial page is dedicated for family, friends and future generations to celebrate the life of their loved one. Angela Frosolone was born on September 20, 1922 in Chicago to Vito and Felecia (nee Iacullo) Sabia. She died Friday, October 19, 2018 in Arlington Heights in Arlington Heights. 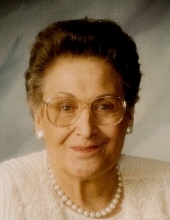 Mrs. Frosolone enjoyed spending time with her family, especially her grandchildren and great-grandchildren, and was loved by all. Angela is survived by her daughters, Marie (James) Kuhr and Julie Seifert; grandchildren, James M. (Beth) Kuhr, Melissa (Tony) Fasuna, Annie Seifert and Julie (Brian) Cullen; great-grandchildren, Anna Fasuna, Adam Kuhr, Matthew Fasuna, Ethan Kuhr, Grace Kuhr, Anna Cullen and Chelsea Cullen. She was preceded in death by her husband, William; her parents; and sister, Marie Sabia. Visitation Saturday, October 27, 2018 from 10:00 am until the 12:00 pm Prayer Service at Glueckert Funeral Home Ltd., 1520 North Arlington Heights Road (4 blocks south of Palatine Road), Arlington Heights, IL 60004. Interment will be private. In lieu of flowers memorials may be given to your charity in Angela’s name. Funeral Information and condolences can be given at www.GlueckertFuneralHome.com or (847) 253-0168. "Email Address" would like to share the life celebration of Angela Frosolone. Click on the "link" to go to share a favorite memory or leave a condolence message for the family.